Welcome to the blog tour for THE TELLING, the first book in the young adult fantasy series, The Spinner Sagas, by K.J. Moullen. See below for information on the book, buy links, an exclusive guest post, and details on her giveaway. Sixteen-year-old Blaine was a normal teenage girl. Sure, she moved around a lot, but that wasn’t completely weird, right? Then her mom tells her she’s actually from another dimension called Renault, whose inhabitants can do magic. Um, what? Suddenly, Blaine is running from an evil she barely understands. Blaine is thrust into the confusing, beautiful, and magical world of Renault with a mysterious boy she just met. There, she begins to discover her own unique abilities and her place in the universe..
Before the journey of writing a book begins, I think every author strives to create a story that will intrigue the reader’s imagination and keep them turning the page to find out what happens next. My hopes did not differ from those that had taken pen to paper before me and achieved that goal. 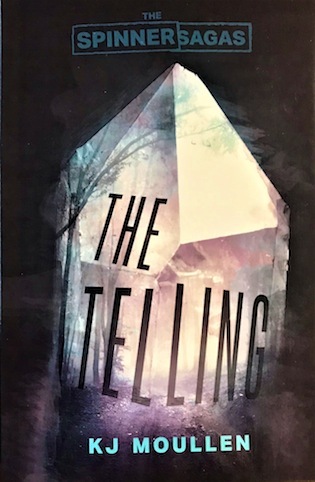 When I began writing The Telling, It was not my intention to share it with the world. Writing as well as reading had always been a great escape from everyday life for me. While I was writing about Blaine and her journey I wanted her to be someone that people could relate to. It is my belief that everyone at some point in their life has felt as if they don’t fit in. We are faced daily with choices and decisions from the trivial all the way to life changing moments. Some of the choices forge a completely different path for us bringing on new challenges and allowing us to grow as a person. At times a decision of another impacts our direction in life and that can make you question who is truly in control. Blaine faces many of these adversities that many of us can relate to. I hope that when readers finish reading the book, they want to know where Blaine’s pathway ultimately leads her. I hope they can visual the beautiful worlds, fantastic creatures and magical elements in their mind. I hope they long to pick up another book, whether it is mine or that of another author. I also hope that they are able to take away from it a sense of empowerment, a deeper sense that we are all connected at a higher level and we all have a purpose. I hope Blaine’s journey shows that our choices, right or wrong, can and do affect the world around us. Finding our purpose may be more difficult than it seems or maybe it just takes looking deep inside and believing in something that has been there all along. Mostly I hope people understand when they believe in themselves, the key to knowledge is theirs for the taking. K.J Moullen started her life as an adventurer. She always loved the outdoors, whether it was playing king of the hill with her pet goat in southern California, playing hockey on the frozen lakes of the Kenai peninsula of Alaska, or snorkeling and surfing off the shores of Maui. Amongst the breathtaking places she lived, her imagination and love for writing knew no limitations, allowing for a lifetime of plotlines and characters to be created and written about. 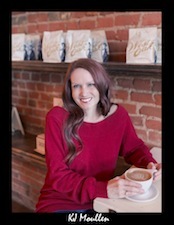 She now shares her life’s adventures with her husband and two children in their home in North Texas..